With effect from April 1, 2019, Access and Diamond banks will become one to be known as Access Bank, and just like United Bank for Africa Plc (UBA) -Standard Trust Bank (STB) merger, youngest largest bank in Africa will retain Diamond logo and colours as brand identity. This formed key approvals by both shareholders of the two banks in two different Extra-Ordinary General Meetings in Lagos on Tuesday. It would be recalled that at the time of UBA-STB’s merger on July 6, 2005, while UBA was retained as the brand name, the red colours and ‘S’ logo of STB were equally retained till today. Otherwise, UBA and STB became the first big banks to merge during the then consolidation ordered by the Central Bank (CBN), after holding their Extra-Ordinary General Meetings in Abuja where the shareholders of the two banks gave approval for the merger. Still on Access-Diamond deal, the strategic takeover of rival Diamond Bank got consummated in a $235 million deal which had earlier received all relevant regulatory approvals. Business Hilights recalls that earlier December last year, Access had agreed to buy mid-tier lender Diamond Bank with cash and shares, creating a bank with 29 million customers, which the two banks have said is more than any other bank in Africa. Industry pundits are upbeat that the merger which came with strong traces of hostile takeover, will shrink the number of players in the nation’s banking space even though the traditional top five banks that control more than 60 percent of assets will remain unchanged but with Access now displacing First Bank as clear leader after all. The troubles that lead to the hard to mention hostile acquisition had started in Diamond Bank with liquidity ratio crisis since 2016 fueled by loan losses. Part of the stress forced the bank to sell its foreign subsidiaries including the UK branch. The United States equity firm Carlyle, is one of the main shareholders in Diamond Bank, which has a strong focus on banking for retail customers and small businesses. 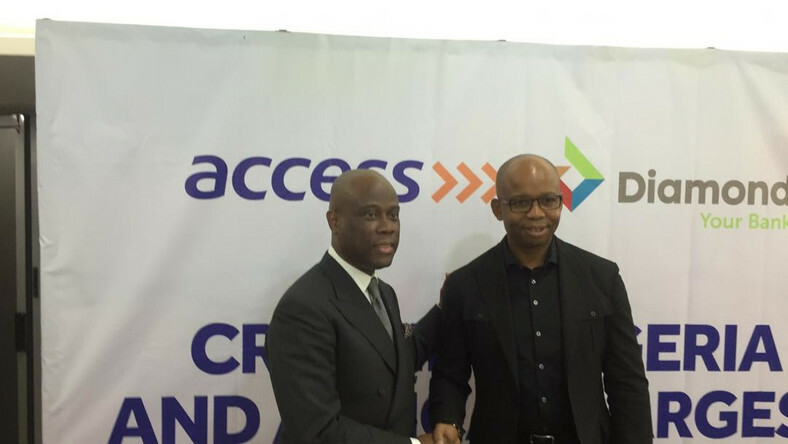 Observers say with the consummation of the merger, the new Access Bank will leverage more on Diamond Bank’s leading digital banking platform, the Yello Diamond Account to deepen Nigerians appetite for e-transactions from April 1.